These are our policies for services, procedures and payment. 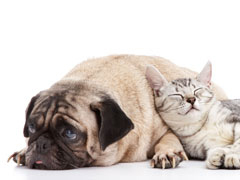 Animal Dentistry & Oral Surgery Specialists-Milwaukee/Oshkosh is a referral only practice providing specialized veterinary care for companion animals. A referral is desirable to help enable us to work as a team, allowing optimal care for your pet. The benefit of having a veterinarian referral is to improve communication between veterinarians and to avoid duplication of efforts and un-necessary expense. We will schedule appointments for consultations. These appointments are intended to be informative only without sedation or anesthesia of your pet. No attempt is made to take dental radiographs or to perform specific diagnostic tests. This appointment allows clear communication between you and Dr. Kressin to best understand your pet's problem(s) and your concern(s). You may be asked to withold food even if anesthesia is not anticipated. For your convenience and to eliminate un-necessary delay in treatment, the dental or operative procedure follows the initial consultation (on the same day). Witholding food six hours or more before the procedure is important to reduce potential anesthesia complications. We don't want your pet to be dehydrated. Water is allowed until the morning of the appointment. For the safety of all animals in our care, we require that all vaccinations be up to date. Even though we make every effort to make our patients feel comfortable during visits, they may be a little uneasy about new people, new surroundings and other pets. This is one of the reasons we ask you to restrain your pet. We recommend that animals be placed on a leash or in pet carriers before entering the reception area. We require full payment at the time that services are rendered. For your convenience, we accept Visa, MasterCard, cash and personal checks. For checks, we require a photo ID such as driver's license.